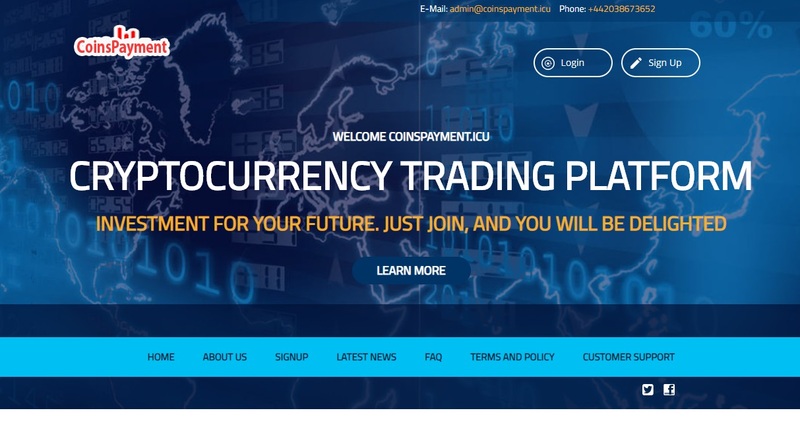 BTC Global, CoinsPayment, Sanfunds, SuperHitRoi, LongTrade, Coin-Invest and Coinlux all have the same website. They all promise the same thing. Namely four investment plans with up to 117% returns per hour. All the mentioned programs claime to be run by real companies. As you can see on our picture, all these programs have identical websites, only the names change. This prove that they all are the same scam. There is no real company behind them, the certificates are fake, the links to the Companies House website are not working. There is no real business activity going on within these programs, they all are just Ponzi schemes. You can see it by the numbers, 117% hourly is totally absurd na totally impossible in any legit business. These programs are all the same, they will just collect money and pay you nothing. If they pay some profits, it will be just to attract more deposits and they will close down. This is the inevitable end of these schemes, they don’t generate real values, they just play with money they got on deposits. BTC Global, CoinsPayment, Sanfunds, SuperHitRoi, LongTrade, Coin-Invest and Coinlux are all the same scam, stay away from them! If you are interested in making money in real trading, try a free demo with a regulated broker to see how it works. On the demo you will see if you are able to build a profitable strategy that is needed to make real money.